Every Sunday there is a worship and communion service at 10.30 am, following the standard liturgy format of the Scottish Episcopal Church on a user-friendly card. Our aim is to be welcoming and accessible to all, including those familiar with other traditions or with none. Communion is open to all Christian believers; children are welcome and may receive communion or a prayer of blessing at the discretion of their parents. Music is a mixture of traditional hymns alongside more contemporary songs, mostly from The Source songbooks. Musical accompaniment varies and may include organ, electric piano, plus instrumentalists. Between 4 and 5.30pm on the First Sunday of each month (except July and August), we have Messy Church.This is an hour and a half of activities for families that is quite unlike most people's idea of church! It enables people of all ages to participate together in Creativity with crafts, games and competitions; Celebration with songs, actions, stories and drama and Hospitality - sitting down to eat together. This is a weekly 'said' communion service held at 10 am in the church with coffee to follow. This is a drop-in social time for coffee, cakes and company on Thursdays, between 10.30 and 12 noon. Kids are welcome, bring a friend. The Foodbank is open from 11 am and other Social Support Agencies are on hand. These are for the purpose of encouraging faith and friendship in an informal setting and may include bible study, discussion and prayer. 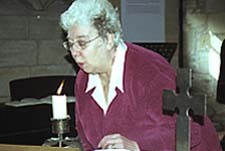 Small groups are held at different times of year such as during Advent and Lent. Details can be found on the Termly Church Programme Card. Saturday mornings about once a term between 8.30 and 10 am, a social get-together for men. Breakfast cooked between themselves in the church. Good for relationships, bad for the chloresterol (sometimes!). This is an informal ladies' group meeting every couple of months or so. The venue may vary. Dates and details can be found in the Church Programme Card. This is for those who think about life and would like to know more about what Christians believe. Meetings begin informally with a cup of coffee or a light meal together, followed by viewing a video and an opportunity to discuss the issues raised and to see how the Bible deals with them. Meetings are relaxed and open for all to ask their questions and express their views.